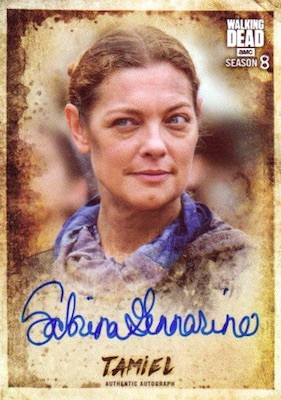 The battle between the living and the dead continues with 2018 Topps Walking Dead Season 8 Part 1. However, collectors have nothing to fear as each Hobby box guarantees one autograph in addition to a second hit. 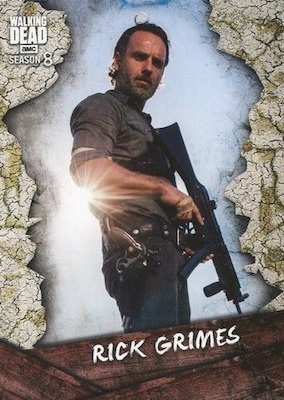 Switching the format from prior Topps TWD releases, it appears that Season 8 is broken down into two different releases as opposed to just one set like Season 7. 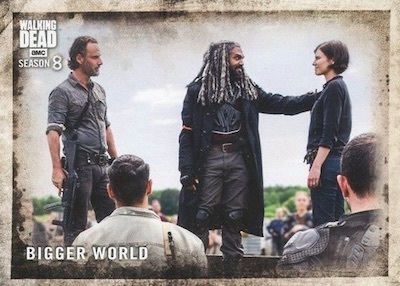 Summarizing straight from the episodes, the 2018 Topps Walking Dead Season 8 Part 1 checklist totals 100 base cards. Rust cards, which come in every pack, are just one of several appropriate parallels, including Mud (#/50), Mold (#/25), Sepia (#/10) and Blood (1/1). The Black and White versions are new, with five copies per card. 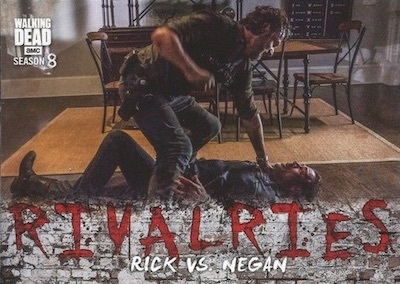 Adding to that, inserts consist of Character cards, Many Sides of War, Rivalries and Walkers. 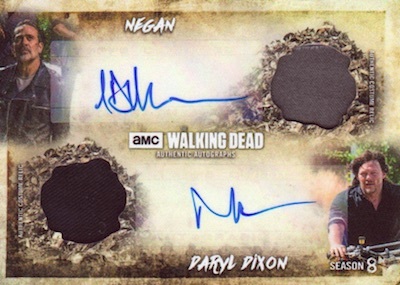 While the base set and inserts are fairly simple, 2018 Topps Walking Dead Season 8 Part 1 has a much more expansive selection of autographs and relics. The base Autographs can be found as Rust (#/99), Mud (#/50), Mold (#/25), Sepia (#/10), Black and White (#/5) and Blood (1/1) parallels. 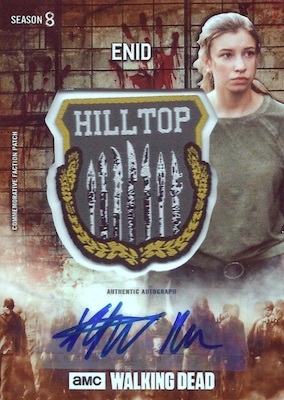 In addition, Dual Autograph and Triple Autograph cards offer new parallels via Black and White (#/5) and Blood (1/1). 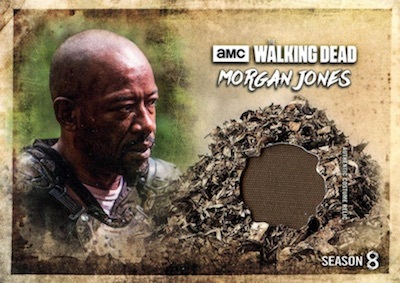 Tying in directly to The Walking Dead, 2018 Topps Walking Dead Season 8 Part 1 features Costume Relic cards with items used in the production of the show. These have the complete run of parallels, as well. 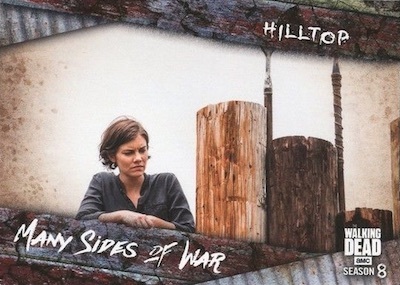 A signed version is available with the Autographed Relic set that has Sepia (#/10), Black and White (#/5) and Blood (1/1) parallels. More choices include Dual Costume Relics and Dual Costume Relic Autographs. Both have Black and White (#/5) and Blood (1/1) parallels, while the relic-only dual has the Sepia (#/10) option. Going out with one final choice, the Commemorative Faction Patch and Commemorative Faction Patch Autograph cards contain manufactured relics with Rust (#/99), Mud (#/50), Mold (#/25), Sepia (#/10), Black and White (#/5) and Blood (1/1) parallels. PARALLEL CARDS: Rust (1 per pack), Mud #/50, Mold #/25, Sepia #/10, Black & White #/5, Blood 1/1. PARALLEL CARDS: Rust #/99, Mud #/50, Mold #/25, Sepia #/10, Blood 1/1, Printing Plates 1/1. PARALLEL CARDS: Black & White #/5, Blood 1/1. PARALLEL CARDS: Rust #/99, Mud #/50, Mold #/25, Sepia #/10, Black & White #/5, Blood 1/1. PARALLEL CARDS: Sepia #/10, Black & White #/5, Blood 1/1. Did 1 box…got a sketch and a relic…does the sketch count as an autograph since the arftist signed it? 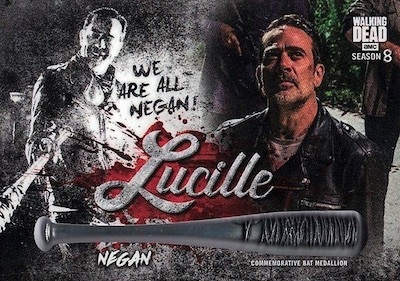 If not then Topps has some ‘splainin to do. 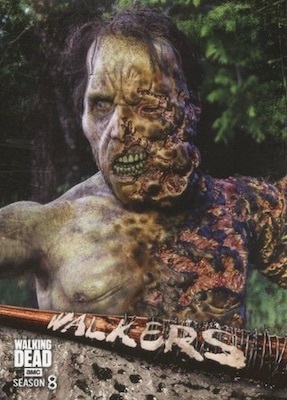 Otherwise, pretty standard for Topps Walking Dead…Crypto was better but didn’t pay enough for the rights. Sketches are counted as autos. Also, is there a list of contributing artists for the sketches?